19:12:17Any event sponsored by a brewery is guaranteed grough's attention, so it's no surprise that a little festival in the Lakes caught our eye. Jennings, the Cockermouth brewery , is one of four sponsors in a geocaching event based at Borrowdale youth hostel in September. The weekend event, aimed at testing skills using Global Positioning System (GPS) units, is being run by GPS Training and GeoTrailing.com. The YHA is the fourth partner. Details of the event are on the GPS Training website. It'll cost you £125 for the full two nights' board and participation in the event, or you can buy a day pass for £29. If you don't fancy forking out for the weekend, you can still win a year's beer from the Cumberland Ale purveyors. 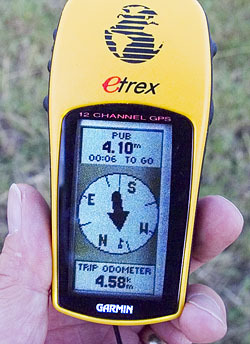 You'll have to follow a trail, downloadable from the GeoTrailing.com website, find the 'virtual caches' at various grid references and fill in the answers. You then have to get a password from GeoTrailing before sending a questionnaire including the password to Jennings. Sounds complicated? It does to the simple minds at grough. Since each trail is based around one of Jennings' pubs, we suggest you fill in the answers on the trail and then visit the pub. Then try and remember where you put the answers and where you left your GPS. Essentially, it's a new take on the old treasure hunt idea, but using Uncle Sam's Defense Department information to lead you to the clues. Many of the trails are in the Lake District, as you'd expect from a Cockermouth brewer, but there are other routes in areas such as the Yorkshire Dales, Speyside and Northumberland. Full details on the GeoTrailing.com website.